In a medium dutch oven or heavy bottomed pot heat the olive oil and add the onion. Cook on medium low for 7-10 minutes or until onions are very tender and slightly browned. Add the lentils, briefly stir then add the broth. Heat to a boil then reduce to a simmer. 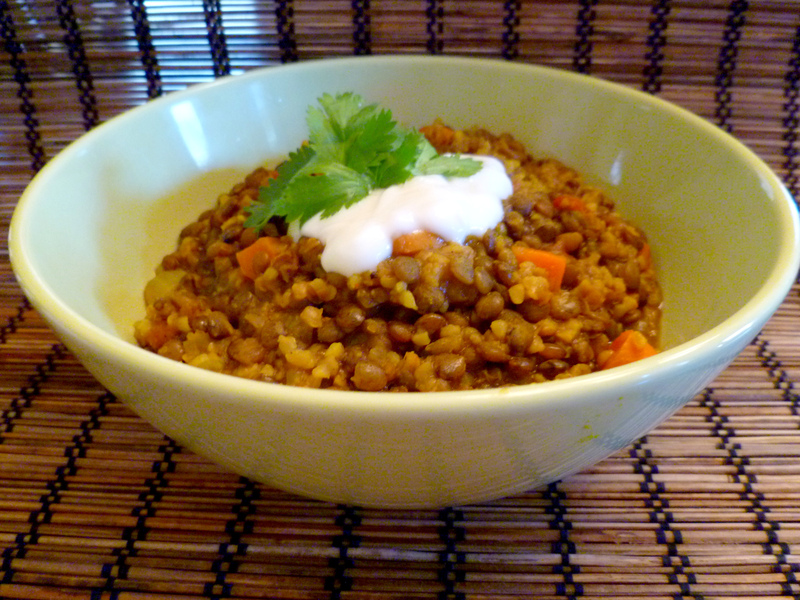 Allow to simmer for about 15 minutes or until lentils are tender. Add the carrot, bulgar wheat, ginger, garlic and the rest of the spices. Add the salt in increments to taste; you may use more or less. Return to simmer and cook until carrots are tender and bulgar wheat is absorbed and soft. Serve with soy cream (if vegan) or sour cream or plain yogurt (for vegetarian), chopped green onion and cilantro. This looks so good! I rarely eat lentils, but I definitly want to try this out! I’m definitely going to try this, thanks!